Designed for warm water diving with aluminum 80s, the Nomad LT is our lightest and most streamlined sidemount rig in the Nomad line. 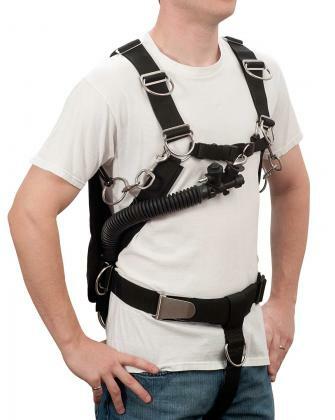 Available in either an overhead environment model (BC4525) or an open water model (BC4530), the Nomad LTs exceptional design creates the first sidemount rig of its kind that is simple to set up and configure with an all-in-one webbing harness and wing combination. Pivot points at the chest provide comfort for women and large-chested divers and stainless steel slides at the waist provide a customizable fit. See our Nomad LT Fitting Video for tips. access to bottles. SuperFabric® brand technology on the outer wing provides optimum resistance to punctures and abrasions, while remaining very flexible. On Model BC4525, pull dumps are located on the bottom with the inflator on the inside right and OPV located on the inside left. On Model BC4530, pull dumps are located on the outside left and inside right of the wing and the inflation hose is located behind the shoulder for easier dumping in vertical positions. On both models, these can be reversed by the diver, if desired. Integrated daisy chain technology gives divers the option for Nomad Loop Bungees or a standard bungee according to diver preference. Two, separate bungees, rather than one continuous bungee, provide greater control in the case of a failure. carry twin aluminum 80 cylinders with a wetsuit or Faber steel 85s when wearing a drysuit. ** Made in the U.S.A.
** Faber steel 85s are lighter than other brands of similar size tanks. Only wear Faber steel 85s with the Nomad LT.
*** Due to a lift capacity of 22lbs, the Nomad LT is designed to support a maximum of 10lbs of additional weight worn for trim or buoyancy purposes. All-in-one, non-modular rig is one complete piece. Comes standard with our tank chokers (BC2720) and ring bungees (BC2722). Standard 12-inch reverse inflation hose. 16-inch available upon request. 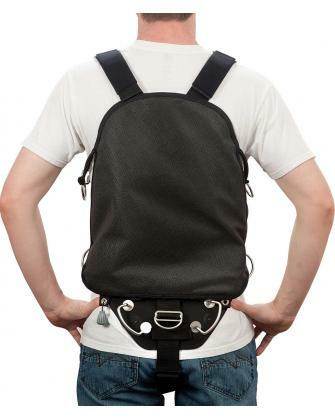 Black outer bag is made of SuperFabric brand technology and 1000 denier Cordura® offering superior durability. Faber steel 85s are lighter than other brands of similar size tanks. Only wear Faber steel 85s with the Nomad LT.
Due to a lift capacity of 22lbs, the Nomad LT is designed to support a maximum of 10lbs of additional weight worn for trim or buoyancy purposes. Divers should not wear more than 10lbs of additional.